Looking for dance studio to rent for your own class or rehearsal? Check us out! Our Waterloo studio is 800 sqft, fully mirrored, great sound system, wood flooring, conveniently located, toilets attached to studio and our pricing is affordable! 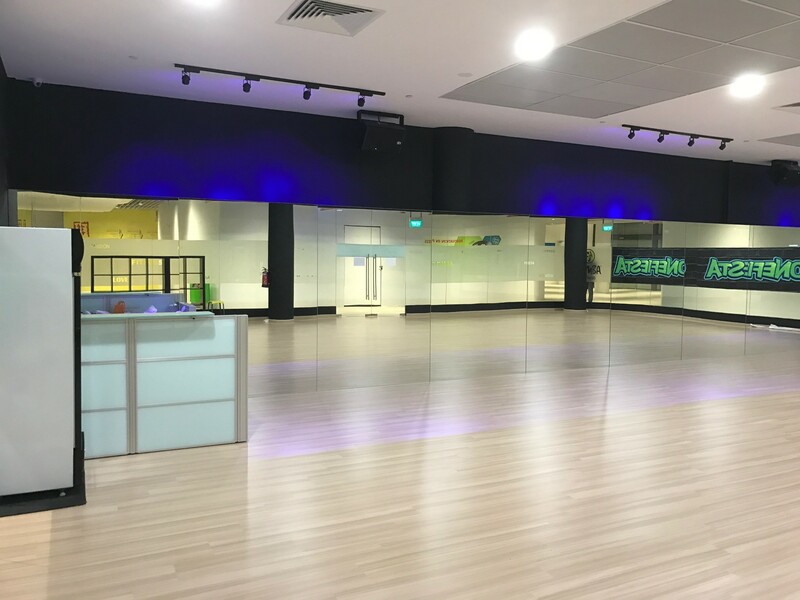 Tampines Hub Studio is 1440 Sqft and our studio at Jurong east central is 1350 Sqft. Discounts for multiple hours weekly and long term rentals may be discussed. Drop us a message here for more info. Please state which studio location, preferred day / timing and purpose of rental. 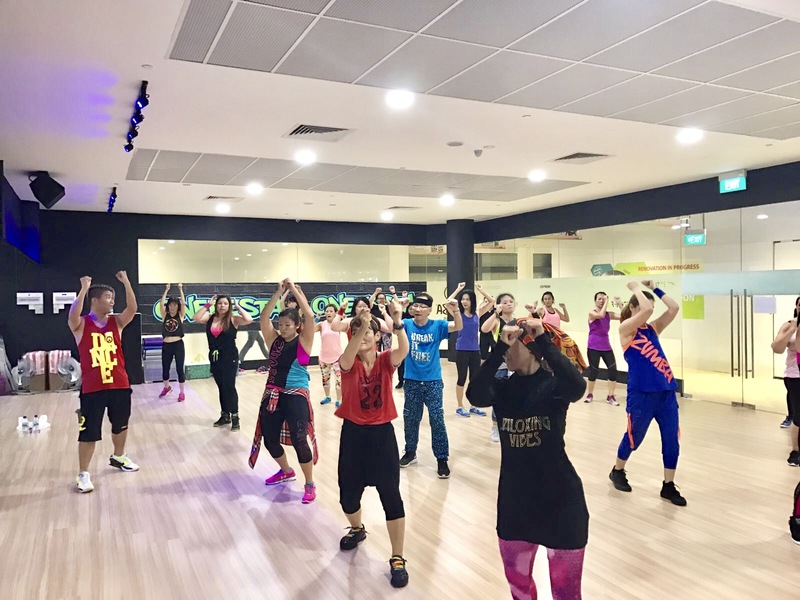 Hi, how much is the cost for a private Zumba Fitness class at Our Tampines Hub? And what is the minimum number of people needed to sign up to open this type of class? Hi, I’ve emailed and have not received a reply yet. I am urgently trying to rent a studio for the following dates and timing. Please get back to me with the measurements (how many meters) of the Waterloo and Tampines studios. Not the sq ft.
East Central on the following dates for Yoga classes for 20 to 30 pax per session. who i can Speak with in relation to this matter. This is Jennifer Goh from People’s Association. Also, does the studio allow street shoes? Hi. I have sent an enquiry on the Jurong East studio rental for our corporate yoga programme but have not heard from you. Just like to find out if there is a special package for rental for 8 hours/10 hours (once per week on a weekday) and if the studio is able to accommodate 20 pax comfortably for yoga. Appreciate a reply as soon as possible as we are looking to start the class end September. hi will drop you an email. Can I book your studio for an hour for a cajon get-together? I’m a cajon instructor and I’m looking for a place to hold monthly cajon get-togethers for my students and friends. The cajon is basically a box drum that is very popular these days. Hi will email you in a PM. Hi! I am sorry I didn’t put the statement properly , i want to ask is the next Saturday 1 to 3pm Waterloo studio available ? And also is it ok for me to hold my hold classes ? Hi! I wanna book next sat 1 to 3pm to hold my classes may I know is it available , and also is your ok for me to hold my own classes ? hi we got your email! May I know if the Waterloo studio is available on Saturdays 1030-130pm? Thanks! Hi we have saturday morning classes till 1215pm weekly. Thank you so much. Hi, had tried to send an enquiry but it seems that your web jad some issues. Can i know if there will available slot in Feb for 1 sat 10-11am? Hi! I am interested in booking your studio (Waterloo) for a Friday evening in February (somehow the contact us form is down). I am looking at 7.30 to 10.30 pm. Can I check on the availability of the studio, and would it be possible for me to come down to take a look at it? But we have classes at Waterloo every friday evening from 630pm-830pm. 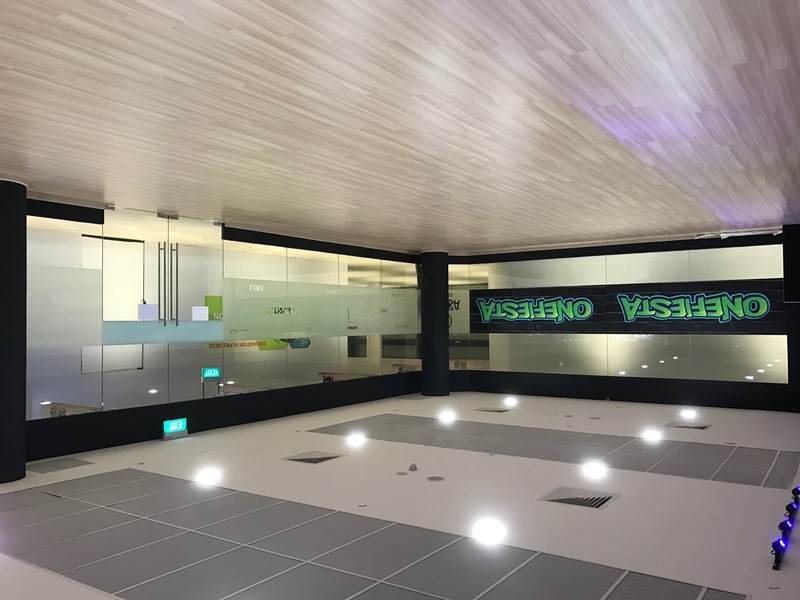 Thanks 1fiesta, is your Golden Mile studio available by any chance for those timeslots? There are fridays evening classes at Golden Mile 715-815pm weekly. How about 8.30 to 10.30, at either of the two dance studios? Hi there, I’ve emailed you regarding rental of space at the Golden Mile Studio for a regional cable tv shoot on 20 Nov 2016. Kindly get back to me asap. Thanks much! I’ve dropped a message a couple of times, but maybe it didnt go through! Need to book rooms for Nov evenings, please do let me know soon! Do email us at info@1fiesta.com.sg for further discussion. Thank you. I am looking to rent the studios for Flamenco and would like to check if you have any restrictions on dance forms studios are rented for, as Flamenco is a percussive dance form. Will PM you via email! Would like to check if I am still able to make a last min booking for today at Tampines studio, any slots left? Is there any contact I can call it for more details? I would like to check if the Golden Mile studio is available for 5 sessions presently, ie every Monday, April- May 2016, 6.30-7.30 pm slot for a recurring company event ? How many people can be accommodated in the studio? Please feel free to contact directly via mail for further details. Is it possible to visit the studio? I have replied to you at your e mail. I would like to rental a dance studio. Hi, I would like to rent the Waterloo studio between 9-10am or 12-1pm on Weekdays. Please let me know which day is available and if you will do block booking. Thanks in advance. May I know what class will you be conducting at the dance studio? For weekdays, it will be easier for us to arrange for someone to be there to open the studio at 12 – 1 pm on Mondays or Tuesdays. Yes, we do block booking. Hi, may I know if the waterloo studio is available for rent on Saturdays 11am-12pm and 2pm-3pm? Is there any lifts to go up the studio? As i have been there and i always take the stairs up. We have classes at Waterloo until 11.30am… so it would be available from 12pm. There is a service lift on the other side of the building that will go to our floor. Hi, i am wondering which room will be most suitable for 24pax. Looking for a space to hold a christmas/new year party on 30th Dec. May i know what kind of amenities will be provided, like tables and chairs etc. Thank you! All of our studios can hold 24 pax, we do not have tables and chairs available and I’m afraid that food/drink is not allowed in the studios. Hi, I am Sebastian from En Motion. Which studio do you recommend to accommodate 150pax? Our Golden Mile studio would be able to accommodate this depending on what you want it for. I would like to rent the studio at tampines on 24 oct, plss let me know the availability. Hi Trichael … I have just sent you an email. I am keen on Waterloo street and Tampines for my Hiphop & Bboying Classes! Do contact me via email soon! I have replied to you at your e mail. Do communicate with me through e mail. Hi I have sent an urgent enquiry to book Jurong East studio for 8 weeks, starting next Tuesday 29 September, 7.45pm-8.45pm or alternatively at 8-9pm. Kindly revert back as soon as possible otherwise would it be possible if I drop by tomorrow to secure. Thank you. I would like to rent your studio in Tampines. Can you advise the availability? Ive replied to your email and is awaiting response. Hoping for a favourable reply from you! Hi, I wish to rent the Jurong East fitness studio from 4pm-6pm on 23rd Sept. Kindly get back to me soon. Thank you. 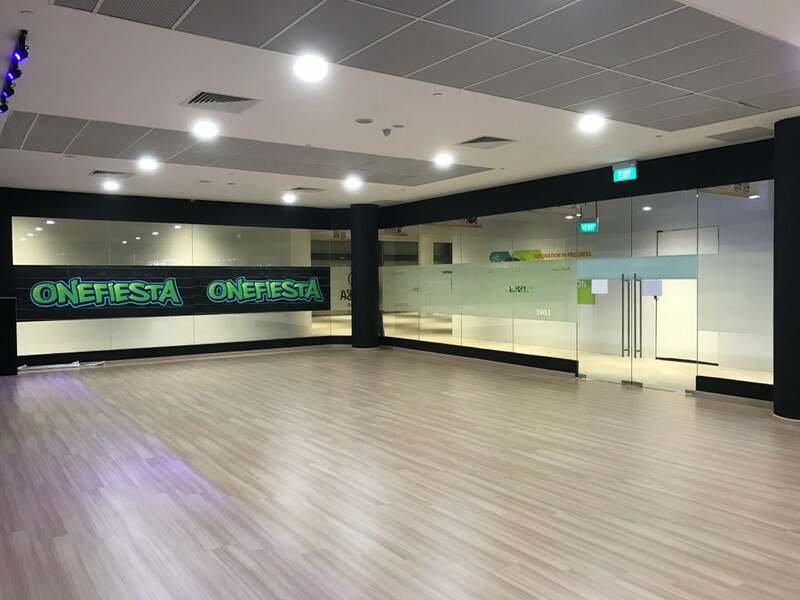 hi, is the tampines dance studio available for rent from about 8-11am on 15 Aug? pls email me for availability and more info abt the studio tq! Apologies, I have just seen this message. 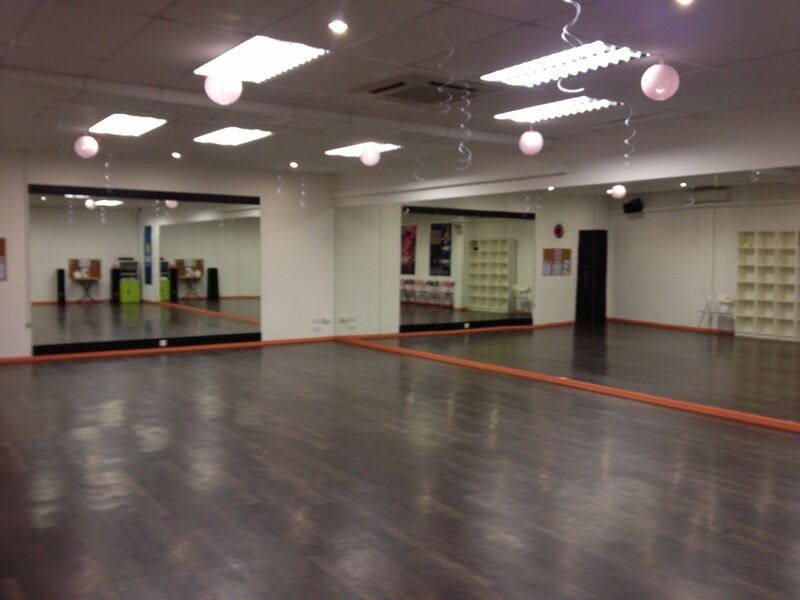 Im keen to rent your tampines studio for my private group of members for Yoga & Fitness Dance lessons. Please adv what are the available time slot of Weekdays. I have replied to you at your e mail. Hope to hear from you soon. 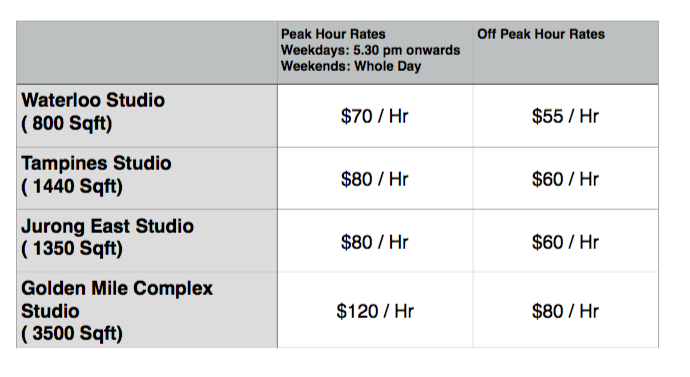 Our Jurong East studio rental rate is $60 for non-peak hour and $80 for peak hours. 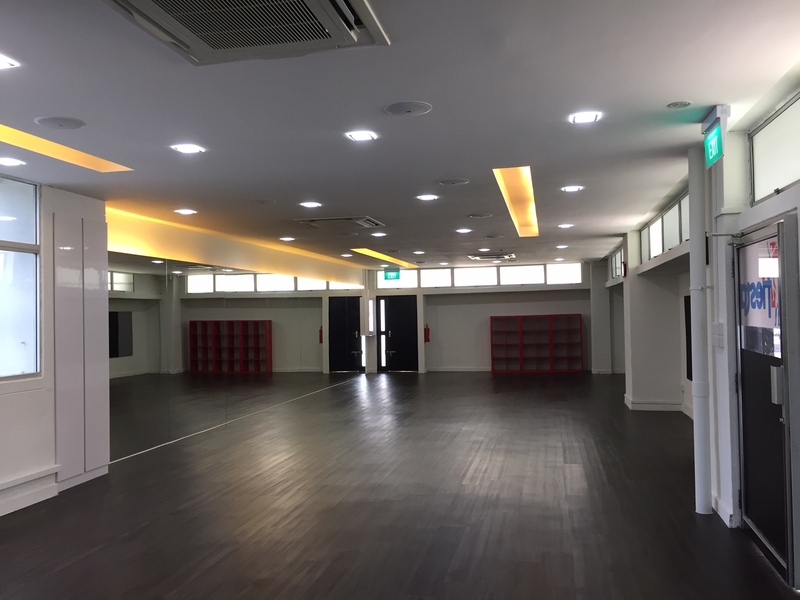 Hi, would your jurong east branch be available for rent for martial arts lessons? I am looking for studio to conduct my strengthening and body toning classes on Sat 1.20-2.30pm, Is the studio at Jurong East available? I have replied to you at your e mail already. Hope to hear from you soon. Do you provide any microphones? For the Golden Mile complex and Jurong East studio, we have hand free mic. Not for Waterloo and Tampines. Is the rate for your studio rental is per hour basis? Yes, the stated rate is by per hour. Hi, I would like to ask if I can book an earlier timing instead of 6pm-10pm on the weekdays? Sure. Of course. In fact, there are more available time slots before 6 pm and it will be on an off peak hour rate. Yes, the Tampines studio has mirror wall. I have e mailed you with more details. Hope to hear from you soon. May I know which studio and what time are you looking at? I have sent you an e mail. We can communicate from there. 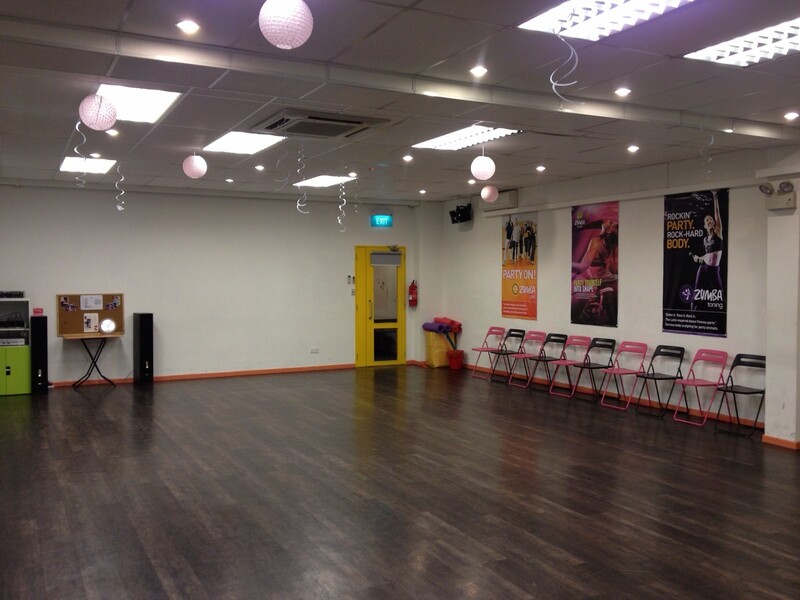 The Jurong East Studio is about 18 m x 6.6 m.
I would like to enquire on the dance studio rental rates. Based on your website, it states that during Peak season, it will be $60/day during the weekend. Is there a particular time frame, for example 9am to 9pm? Or are users able to use it for unlimited amount of time over the weekend? are there any slots available for saturdays? The rental rate is $70 per hour during the peak hours and $55 per hour during the off peak hours for the Waterloo and tampines studio. It is also subject to the availability of the studio. so in this case, weekends are considered peak hours? still available for weekdays tampines studio ? we are really keen for weekday evening slot. Im afraid we have classes every evening during the week at Tampines, if you wish for an evening slot we only have Saturday and Sunday evening available. Tampines is available to rent every afternoon (except Thursday) for rental. 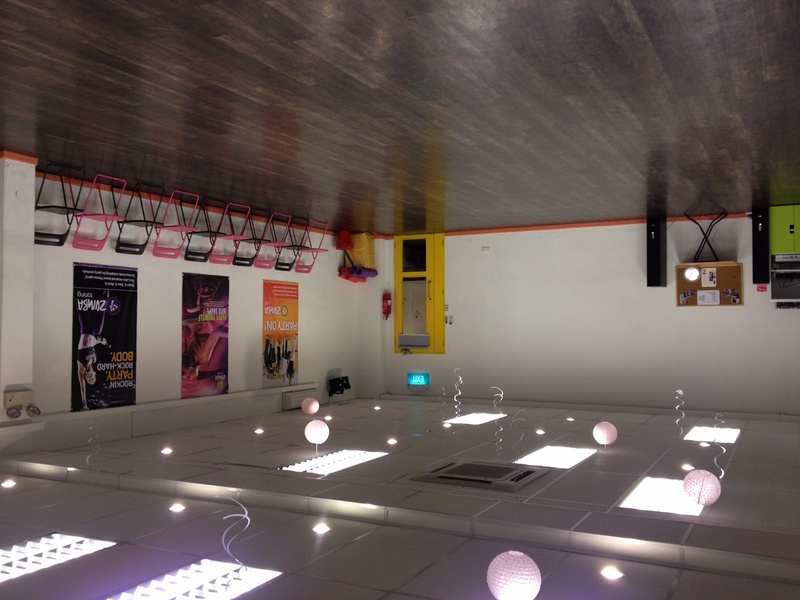 I am interested to rent the Waterloo Dance Studio on 29th October 7:00 – 9:00PM. However, I will be using it as a venue for a surprise disco birthday party. I will have around 20 guests. Would that number be accommodated in this studio? Also, I plan to serve drinks and some finger foods. Is that possible? I can assign people to take care of the cleaning after the party. I hope you can accommodate my request. Looking forward to hearing from you soonest. Thanks. Thanks for your message, unfortunately we have classes on at this time so would not be able to rent it out. The only evenings Waterloo is available at these times is Saturday and Sunday evening. Let me know if these are any good for you. 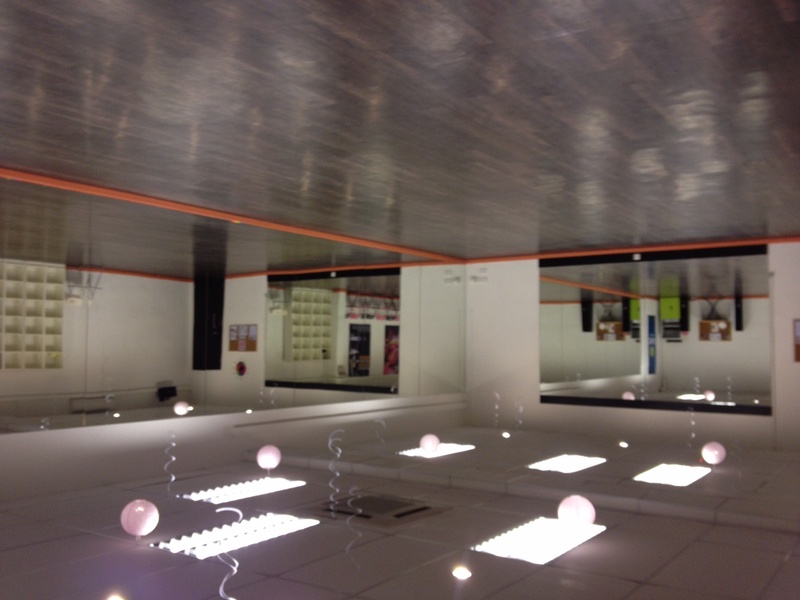 Hi, i am looking for a rental studio for my own dance practicing. Please let me know how much it costs me if i rent a waterloo one off peak time for 2 hours. It will be $55 per hour. I have tried to contact you via your website but have yet to receive a reply. Please kindly check my msg and get back to me on the necessary quotation. Have not heard from you since our last e mail. Are you still looking to rent the studio? I need a studio that I can use for my personal dance rehersal, would there be any available in Tampines? Thank you. I have already sent you an e mail. Do let us know what time and day you are looking at. Or if your time is flexible, let us know and that will be easier to arrange. Hello, I’m looking for a studio with mirrors that can fit in 200-300 crowd, do you have any of that ? Thank you very much for your attention ! Unfortunatey none of our studios are big enough to hold this amount of people. I had e mailed you more information about our studio. I had deleted your number for your privacy..
As our studio are fitted with mirrors, I am worried that the balls may smash the mirrors. Also, our studios are not available on weekends mornings. Hi, I am sourcing for a venue for a 2 day, 12 – 5pm martial art seminar on Oct 4th and 5th Sat & Sun. Do get back to me. Cheers! How many people will you be expecting? Maybe you can take a look at our studios before deciding. The only thing is that Our lease for the Golden Mile Complex is ending soon and we will have to review the lease before I can commit to you. expecting 30-35 pax. When will be a good time to visit? can drop me a contact number at ? I had e mailed you. I had also deleted your e mail address from your comment to protect your privacy. I’m keswariya, i would like to enqire whether i’m able to get a dance studio rental for every Saturdays starting from July 2014. Please do advice me. We will need more details. I have sent you an e mail already. Hi. Is the dance studio available tomorrow on 5th june around daytime or morning? We are only using it in the morning and evening. Afternoon is available, but I will need to arrange for someone to be there if you are interested to use it. You can contact me if you are interest. nine three six six six 149. I am currently sourcing for a dance studio to hold weekly dance practice of a round 3-4 hours for a group of around 15 people, and Your studio seems very attractive. However I would like to inquire if shoes are allowed into the studio, specifically heels. Also, is there sound system and power plug available in the studio for us to play our music? Thank your for your time and good day. Yes, Shoes with Heel can be worn at our Waterloo Studio. I have sent you more details to your e mail. Hope to hear from you soon. Just to enquire, other than the hourly rates, do I need to pay a sum of security deposit ? No Security deposit needed, but of course, if you damage anything, you will have to be responsible for it. Hi would it be possible to book a dance studio today? At Waterloo or golden mile? Hope that you managed to get a studio. Let there be any available studios for all these dates, do get back to us with regards to which studios are available and also the available timings so that we could confirm the bookings with you as soon as possible. Hope to hear from you soon and thank you so much! I have replied to you at your e mail already. Yes, the studio will be available at various timing. We can discuss it via e mail. hi do you have availability from 1st week june onwards for 8 weeks on a tuesday,weds or thurs 7-8pm ? Sorry. We don’t have any available slot for 7 – 8 pm. Please advise the availability of Waterloo studios for 01.30pm-3.30pm on march 15. It is available. I had e mailed you yesterday already. Please the availability your Waterloo studios for 01.30pm to 3.30pm on march 15? Do you availability at your bukit merah or Waterloo studios for 6.30-7.30 starting 9 April for 6 weeks? Can we view the studios? hi, is golden mile complex studio avail this Thursday, 19 Dec from 7pm to 10 pm? Me and my cousin would like to rent your tampines studio. When is it not booked yet? I have replied to your e mail already. Do check the spam folder as well if you didn’t get it. I have replied to your google mail already. Please do check your spam folder as well in case it got filtered there. Do let us know your preferred location, day and time. Hi there! My name is Aidil. I would like to rent your waterloo studio on 29 Sep 11-1pm. Could please contact me at 97424470 asap? We have replied you through your yahoo mail. Please check your junk folder just in case it got directed there. Hi, may i ask the photo you published here is of 800sqft? How many people (Maximum) can accomodate please? I’m looking for a second space to conduct my MRT (metabolic resistance training)classes. I currently conduct sessions at 8 Claymore Hill. I am looking at perhaps an extended booking period of up to several months.